It's the most frequently fielded question at MiLB.com and other prospect sites and publications. When is he getting called up? There are, of course, a lot of factors that go into when a top prospect will make his Major League debut -- all of which have to be taken into account even by the most impatient baseball fanatic -- including experience level, Minor League dominance, package of tools, Major League roster situation and, yes, service time. It's not as easy as plugging a big Minor Leaguer into The Show and seeing what happens. But, hey, it's good to have a little fun sometimes, too. This edition of the Toolshed looks into the crystal ball and goes month by month to forecast when some of MLB.com's Top 100 Prospects will make their Major League debuts in the 2019 season. Nick Senzel, Reds -- Call it misguided optimism. But read the tea leaves. The Reds were one of the most aggressive organizations in the game this offseason in adding Major League talent. They left open a spot in center field when Billy Hamilton was non-tendered. They're competing in a division in which all five clubs should be competing for a playoff spot. They can't afford to risk dropping a few games early in the season in order to keep Senzel from reaching free agency earlier in the mid-2020s. With his bat, he's already Major League-ready, and he's got the athleticism to make center work, even after spending all of his Minor League time on the dirt. Here's to seeing two plus two equal four on March 28 in Cincy. 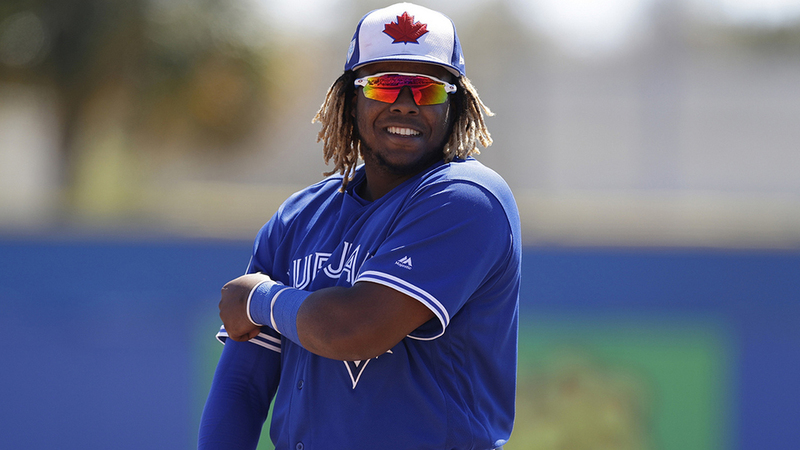 Vladimir Guerrero Jr., Blue Jays -- Most know the drill here. MLB.com's top overall prospect hit .381/.437/.636 with 20 homers last season while playing mostly at Double-A and Triple-A. Still, he'll open the season back in Buffalo because if he stays under 172 days of service time, this won't count as a full year of service toward his future free agency. A full season is 187 days, so a little more than two weeks after the season opens, expect Guerrero to man the hot corner for Toronto. Eloy Jimenez, White Sox -- The same situation applies to MLB.com's No. 3 overall prospect. Jimenez has hit and power tools (.337 average, 22 homers in 108 games in 2018) that are worthy of The Show now. With the White Sox still planning for the future, they won't feel the need to push the right-handed slugger immediately out of the gate. But after 55 games at Triple-A last season, he won't need to be good for Charlotte long in order to punch his ticket to the South Side. Pete Alonso, Mets -- The Mets have said all the right things about letting Alonso compete for the first base job this spring, and injuries to Todd Frazier and Jed Lowrie have cleared even more space on the infield for last year's Joe Bauman Home Run Award winner. But the guess here is that Dominic Smith gets a little bit longer to prove he's a Major League hitter while Alonso lays wreck to the International League at Triple-A Syracuse. Alonso will show even a cold central New York can't hold back his hot bat, and he'll head down to Flushing by the end of the Minors' first month. Fernando Tatis Jr., Padres -- This is when things start to get a little tricky in terms of service time. The Super Two cutoff doesn't have a hard date like that for free agency, so it's hard to predict when teams hoping to delay arbitration will promote their top prospects. They usually hold off until late June to be safe, making May a potential no-man's land for top prospect debuts. However, Tatis is no ordinary top prospect, and the San Diego infield isn't in an ordinary situation. Manny Machado publicly admitted he's willing to play third base because Tatis has shortstop covered. But the 20-year-old (and MLB.com's No. 2 overall prospect) has yet to see Triple-A after a fractured thumb prematurely ended his 2018 season, so the Padres will let him get some experience there while Luis Urias holds down short in the Majors. With plus tools across the board, Tatis should handle the Pacific Coast League with ease in the first couple weeks, and if San Diego can stick around Los Angeles and Colorado in the NL West, it will want to make its Infield of the Future its Infield of the Present ASAP. Forrest Whitley, Astros -- Houston knows what it has in the game's No. 7 overall prospect -- a 6-foot-7 right-hander who throws four plus pitches and can keep hitters at any level off-balance. The perennial contenders also have a legitimate opening at the back end of their rotation this spring. Whitley only threw 26 1/3 innings last season due to a drug suspension and small injuries, so he isn't a contender for that spot now. But a couple weeks of dominant, K-heavy performances in the upper Minors will get him promoted early, giving the Astros three potential aces in Justin Verlander, Gerrit Cole and Whitley for the bulk of the season. Mitch Keller, Pirates -- This is the Senzel situation with a lower ceiling, for the most part. The Pirates need all hands on deck if they have any chance in the wide-open NL Central, and while the rotation is solid, the fifth spot isn't exactly settled. Keller, who made 10 starts at Triple-A with middling results last season, should see the Steel City at some point in 2019. With his plus-plus fastball and plus curveball, he's got some of the best stuff among the organization's starters. It might be an up-and-down situation for MLB.com's No. 19 overall prospect, but Pittsburgh should at the least give Keller an early taste of the Majors if it's going to hang in the division. Jesus Luzardo, Athletics -- The 21-year-old left-hander has certainly made an impression in Major League camp so far, and no one doubts he's capable of someday leading the Oakland rotation. But he was limited to four Triple-A starts at the end of last season, and if there's any organization with an eye on Super Two, it's the A's. Even if he were to be called up by late June, Luzardo would still debut at 21 years old. Sean Murphy, Athletics -- This would just be fun. Murphy is the game's fourth-best catching prospect, mostly on the strength of his defense, and he's already got Double-A experience. Following some seasoning at Triple-A Las Vegas, he'll be ready to pair with Luzardo in the Majors, putting the Minors' most enticing battery on display at the top level. Chris Paddack, Padres -- Paddack has made such an impression this spring with his plus fastball, special changeup and elite control that he's an outside candidate to crack the Major League club out of camp. It's still a long shot after he threw 90 innings last season (37 2/3 of which were at Double-A), but don't sleep on a first-half debut. The Padres might push for a playoff spot with Machado in the fold and many other prospects taking on full-time roles; adding their No. 5 prospect to the rotation will only help those efforts. Logan Allen, Padres -- One of the most popular refrains around the Machado signing had little to do with the infielder himself. "Can he pitch?" said multiple tweets. Obviously not, but if San Diego would consider bringing up Paddack in the first half, it might well do the same with Allen. The 21-year-old southpaw doesn't have the ceiling of Paddack, but the 2018 Texas League Pitcher of the Year does have more upper-level experience, and he's got the package to start. Paddack and Allen could be the beginning of an exciting young arms movement arriving at Petco Park, with pitching prospects like MacKenzie Gore, Luis Patino, Adrian Morejon and others at least another year away. Griffin Canning, Angels -- The No. 63 overall prospect made 13 starts with Triple-A Salt Lake last season, with middling results (5.49 ERA, 1.53 WHIP). That could cause another prospect, like Jose Suarez, to jump him in the line to Anaheim. But he's still got promising potential with four above-average pitches and good control, and the Halos will need all the help they can get coming off back-to-back 80-82 seasons. Taylor Widener, D-backs -- The stuff may not stick out in a big way for MLB.com's No. 83 overall prospect, but the results sure do. His 176 strikeouts in 137 1/3 innings last season (all at Double-A Jackson) were the second-most in all of Minor League Baseball. If he can come even close to matching that whiff rate at Triple-A, an early-season debut is well within reach for the 24-year-old right-hander. Brendan Rodgers, Rockies -- MLB.com's No. 10 overall prospect has already seen Triple-A, and that's usually a pretty good indication that a first-half debut is in order. Yet there isn't an obvious fit for him in Colorado. Nolan Arenado is the (hot) cornerstone of the franchise, Trevor Story continues to have shortstop on lock and Garrett Hampson and Ryan McMahon are ahead of Rodgers right now on the second base depth chart. (Daniel Murphy might also be, even though he's signed to play first base.) Rodgers should hit his way to the Majors at some point -- it's fun to think of what he could do in a second turn at Albuquerque -- but he might have to thrash for an extended period. Keston Hiura, Brewers -- A couple weeks ago, Hiura would have been placed much higher in this column. The Brewers' biggest opening was at second base, and their top prospect just so happened to play that position. However, the club signed Mike Moustakas to a one-year deal, moving Travis Shaw over from the hot corner to the keystone. That'll leave MLB.com's No. 20 overall prospect to develop in his first trip to Triple-A. By the trade deadline at the latest, he should have shown enough there to get a look at Milwaukee, even if it takes more movement around the infield to make it happen. Carter Kieboom, Nationals -- Washington signed Brian Dozier to hold down second base for one year, allowing Kieboom -- a shortstop stuck behind Trea Turner -- to develop a little longer with his first taste of Triple-A. It seems likely that July will be about the point when Dozier (a below-average hitter last season) and Kieboom's abilities to help out the Major League club will cross, making it time for the 21-year-old to bring his impressive offensive tools to the NL East contender. Brent Honeywell, Rays -- This is hedging a little. The Rays and Honeywell have targeted May as a potential return date to the mound following last year's Tommy John surgery, and that'll come in the form of a rehab assignment. Two months of rehab starts, including some legitimately full outings at Triple-A Durham, would land the righty's long-awaited move to the Majors in July. His first screwball will be among the most highly anticipated Major League pitches of 2019. Ke'Bryan Hayes, Pirates -- Colin Moran hasn't looked like the long-term solution at the hot corner for the Bucs. Hayes, with his solid bat and Gold Glove-caliber defense, can and probably will be. Half a season at Triple-A Indianapolis (where he's yet to play) should be enough to prove that. Yusniel Diaz, Orioles -- O's fans will need some sort of excitement this season, and it just so happens that their top prospect, acquired from the Dodgers in last year's Machado deal, is likely to open 2019 at Triple-A. There shouldn't be anyone blocking Diaz in right field, so a decent first half should get him to Baltimore. Ryan Mountcastle, Orioles -- This spring the O's have moved their 2015 first-rounder all around the field -- from shortstop to third base and even to first base -- in an attempt to find get his potentially above-average bat into the lineup soon. If he hits in the International League this summer like he did in the Eastern League last season, they'll find a spot for him somewhere in the Majors and hope he can combine with Diaz to provide some hope in Charm City. Triston McKenzie, Indians -- Barring any last-minute trades, Cleveland is actually pretty stacked in the rotation -- so stacked that it should hold the club's top prospect back a bit. Then again, a team can never have too much pitching, and no pitching prospect in the upper levels of the Indians system can touch McKenzie's potential with his plus fastball, plus curve and above-average change. The AL Central could be harder for the Indians to handle this year, and they should use whatever talent they have to capture a fourth straight division crown. That starts with McKenzie, whenever a rotation spot opens around the All-Star break. A.J. Puk, A's -- Like Honeywell, Puk underwent Tommy John surgery just before the 2018 season -- a huge disappointment, considering he would have likely helped the big club in some fashion. Instead, he's expected to get his chance by the middle of the season. The pairing of him and fellow southpaw Luzardo in the rotation could be special, even if Puk is limited at times down the stretch. Casey Mize, Tigers -- It's fun to dream. Last year's No. 1 overall pick has an advanced arsenal coming out of the SEC with two plus pitches in his fastball and slider and a plus-plus offering in his splitter. He should move quickly with that profile. Kyle Wright was up in the Majors by September in his first full season last year. Mize could beat him there, considering the openings Detroit is likely to have this summer. Dylan Cease, White Sox -- Michael Kopech made his debut last August at a time when the White Sox weren't competitive, and while fans might not want a direct repeat of that outcome here (Kopech underwent Tommy John surgery after four starts), it at least provides a blueprint. Cease can be a hard-thrower and he's got the full arsenal to carve up advanced lineups. Having him, Jimenez and a healthy Kopech all together in Chicago to begin 2020 would bring some excitement back to the South Side and signal that the rebuild era is closing. Keibert Ruiz, Dodgers -- By not being active in the catching market this offseason, Los Angeles has made it clear it expects one of the group of Austin Barnes, Will Smith and Ruiz to take over behind the plate long term. Barnes will have the job to open the year. Smith, who is not a Top 100 Prospect, should get his crack around the middle of the season. All that will come before Ruiz -- who has the highest ceiling of the three -- has a chance to show what he can do, assuming all goes well for the 20-year-old in his first crack at Triple-A. Ruiz has the offensive and defensive skills to make him one of the game's premier catching prospects. The Dodgers may need those services in the final weeks, even if they have to vault him up the depth chart. Austin Riley, Braves -- Riley is in danger of becoming the Alex Verdugo of the Braves system after his parent club signed Josh Donaldson to a one-year, $23 million deal this offseason. That is to say, he could be a Triple-A masher over multiple seasons but still not crack the Majors because the opening just isn't there. The bet here is Atlanta finds some way to use him by August, because his right-handed bat will be too good to keep down. It's possible he could come up earlier should Donaldson deal with more injuries, but no one wants to predict those. A little experience before rosters expand is the safer play. Jon Duplantier, D-backs -- Duplantier has the higher ceiling than his organization-mate Widener, with three above-average pitches. He's also got the Double-A results, with a 2.69 ERA and 1.19 WHIP, albeit in 67 innings. Even after a good stop in the Arizona Fall League, Duplantier still has a little more to prove, particularly given his injury history. It's certainly possible Arizona brings him up earlier, but this timeline would give him a few months of solid and consistent Triple-A production before getting the call, which feels right. Michael Chavis, Red Sox -- It's a similar story here as Mountcastle's, except with a club that is at the complete other end of the competitive spectrum. Chavis was drafted as a shortstop, has played mostly third in the Minors and has seen time at first and second as well. The No. 79 overall prospect could have more power than the typical infielder, and the Sox will want to take advantage. It's also possible he's traded in July and makes his debut elsewhere. Yordan Alvarez, Astros -- The Astros outfield was already loaded enough before adding Michael Brantley this offseason. It's so loaded, in fact, that No. 8 overall prospect Kyle Tucker doesn't have a clear path to playing time. Imagine what that means for Alvarez, who doesn't have the defensive acumen of Tucker but should be an all-around above-average hitter in the Majors. Good teams will always find a way to play good talent, so perhaps it's at first base or DH that Alvarez finally finds a home. Houston will certainly be tempted to get him in the lineup somehow by this point the season. Corbin Martin/J.B. Bukauskas, Astros -- These could just be spot starts down the stretch or even easing in through the bullpen, should Houston choose to handle the No. 81 and 97 prospects similarly to the way they did with Josh James in 2018. Both have the deep arsenals to work as Major League starters, but with Verlander, Cole, Wade Miley and likely Whitley making regular starts, it'll be tough to find rotation spots. If the Astros are to return to the promised land of the World Series, though, they'll need all the arms they can get. These are two of the best the farm can offer. Victor Victor Mesa, Marlins -- This is, admittedly, a wild guess. Having defected from Cuba in May and signed with the Marlins in October, Mesa didn't play at all last season. It could take him a while to get back to speed. He is no stranger to competitive baseball, however. After his years of experience back home and in the Can-Am League, it's possible he's a quick riser through the Miami system. He's the more likely of the Marlins' two Top 100 Prospects to debut in the Majors this year, and if he does, it makes more sense in August than September, as an earlier arrival would mean he could establish a better foundation on which to build for 2020 and beyond. Jo Adell, Angels -- What's a good way to show Mike Trout that you're committed to building a contending team around him? Give him a close look at the most promising of his potential future teammates. MLB.com's No. 14 overall prospect finished the 2018 season at Double-A, and though this will be just his second full campaign in the Minors, he's got the tools to move quickly in 2019. A late season callup is within reach and quite possible should Los Angeles look like a contender. And, hey, should Adell struggle in the Majors as a rookie, well, someone else happened to do that his first time up, and he turned out just fine. Ian Anderson, Braves -- Atlanta brought up arm after arm while chasing the NL East title in 2018, and considering the division should be even more competitive, the Braves figure to do the same with the next wave of pitchers. The only reason Anderson isn't higher here is the wealth of Major League-ready arms in the system will mean he'll get his chance to start at Triple-A and Double-A as long as possible. When rosters expand, Atlanta will be able to use his plus fastball and plus curveball more easily. Alex Kirilloff, Twins -- Yes, Kiriloff and Royce Lewis have been virtually attached at the hip since this time a year ago, so it may be odd to see the outfielder here and not the shortstop. However, Kirilloff is one year older -- he missed the 2017 season due to Tommy John surgery -- and is coming off the more offensively dominant season, one in which he led the Minor Leagues in extra-base hits. The Twins have been active enough in their offseason attempts to make a division race out of the AL Central, and bringing Kirilloff's hit and power tools would be an internal move toward that end, even this late in the season. Luis Garcia, Nationals -- Washington hasn't shied away from being aggressive with top prospects in recent years, with Robles going up for the stretch run in 2017 and Juan Soto getting the call much earlier last summer. Garcia, who will turn 19 in May, could be the next in that line, with the NL East expected to be incredibly close. Sure, the Nats should be set on the infield -- remember Kieboom's predicament? -- but they also looked like they had a full outfield when Soto came up. Good prospects can be disruptors, and Garcia has a puncher's chance at that with his above-average hit tool. If nothing else, he could serve as solid left-handed bat off the bench.